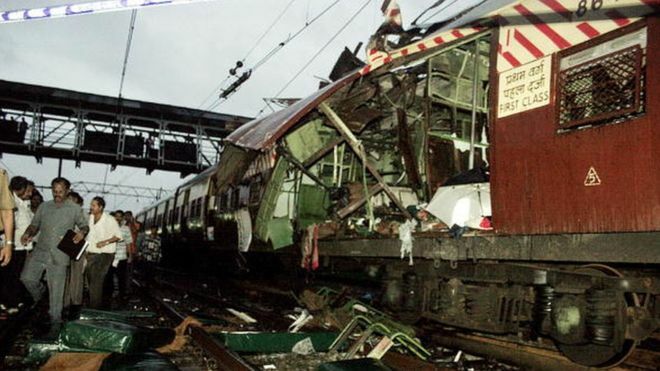 A court in India's western Mumbai city has found 12 men guilty for their roles in the 2006 bombings of commuter trains. The 12 men were accused of waging war against the nation, conspiracy and murder. One man was acquitted. The serial bombings on 11 July 2006 killed 189 people and injured more than 800. The attack was blamed on Islamic militants backed by Pakistan, an allegation that Pakistan has denied. Sentencing is expected to be pronounced on Monday after judge Yatin D Shinde hears arguments from the prosecutors and defence lawyers. The guilty face the death penalty or life in prison. "Justice has been done for the people of Mumbai. I will ask for the strictest punishment when I argue for their sentences," public prosecutor Raja Thakre told reporters. The bombs were packed into seven pressure cookers and put in bags. The co-ordinated explosions were detonated within 15 minutes of each other. The blasts took place in the areas of Matunga, Khar, Mahim, Jogeshwari, Borivali and Mira Road, with most on moving trains and two at stations. The bombs appeared to have targeted first-class compartments, as commuters were returning home from the city's financial district. More than 200 witnesses were examined during the eight-year-long trial, which concluded in August last year. Prosecutors say the attack was planned by Pakistan's intelligence agency ISI, and carried out by operatives of Pakistan-based militant group Lashkar-e-Taiba with help from the Students' Islamic Movement of India, a banned Indian group. Pakistan had rejected the allegations and said India had given no evidence of Pakistani involvement in the attacks. Mumbai's suburban train system is one of the busiest in the world, carrying more than more million commuters a day. November 2008: Gunmen carry out a series of co-ordinated attacks across seven high-profile locations, including two luxury hotels, city's main commuter train station, a hospital, a restaurant and a Jewish centre, killing 165 people.